Roman historians and authors recount the tales of many Roman youth who had influence—for better or for worse—upon their society and therefore upon subsequent history. Ascanius, Camilla, Cloelia, Alexander the boy Emperor, and many more are highlighted in 24 entertaining chapters. 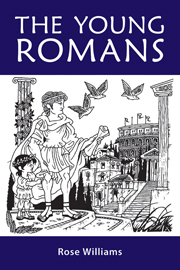 Designed for beginning high-school and middle-school students of Latin, The Young Romans tells the stories of these youth, in simple Latin with background notes, grammatical helps, and exercises. Mark Bennington's distinctive line illustrations enliven the Latin text. Students will enjoy reading and discussing how the actions of these young people of ancient Rome measure up to modern as well as to their own era's ethical standards—how they succeeded and where they failed. This reader makes an excellent choice for a character-based curriculum. A Teachers' Edition (full student text, translations, answers, and more) is available separately. This unique textbook focuses its study not only on the language of the Romans but also the stories of its youngest heroes. Within these pages 24 young men and women come to life in their most challenging moments of courage and readers can gain much by the stories of Ascanius, Camilla, Amata, the young Julius Caesar and Octavian along with many others. Each chapter begins with a brief introduction before the Latin text which is supported by ample vocabulary lists and exercises ranging from simple comprehension questions to crossword puzzles and even arts and crafts. It is truly a wonderful book for the young to explore the Latin language along with the remarkable protagonists that can inspire a new generations of heroes their age.